Henry Lepp (1927-2015) and George Lepp grew up on a grain farm in Saskatchewan. In 1946, while the boys were still in their teens, the family moved to Abbotsford, British Columbia, purchasing a farm on Jackson Road. 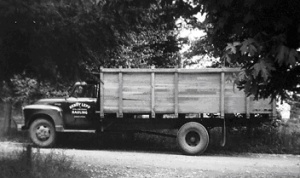 In time their father, Jacob H. Lepp (1892-1977), acquired a three-ton truck, the beginning of what would become the Lepp Trucking Company. Curiously, Jacob Lepp never drove the truck himself. However he was keen to employ his sons. Initially, this truck was used to haul hay to local farmers. However, since Jacob was also the manager of the Abbotsford Growers Co-operative Union, a soft-fruit processing and packing company, he was able to assign his own truck to transport berries. Here was the occasion to hire his 18 year-old son Henry, hauling flats of berries from the farmers to the plant. At the same time, processed fruits needed to be shipped to markets in Vancouver, British Columbia and beyond to Bellingham and Seattle in the United States of America. Conveniently, Abbotsford farmers required ever increasing amounts of fertilizers for their berries, another trucking opportunity for the enterprising Lepps. The Fraser Valley flood of 1948 offered unique business opportunities, hauling cattle from the flood ravaged areas to holding barns at the Abbotsford Airport, and then hay to feed the animals until forage crops could again be harvested a good while after the flood. With his father’s blessing, it did not take Henry long to expand the business. The Roger’s Feed Company needed help hauling feeds to local famers. Moreover, flood damaged dykes were in want of repairs, requiring the addition of a dump truck. By 1957 the company had grown to such a size, making incorporation desirable. Also, during this year, Henry’s younger brother George joined him in operating the enterprise. However, the lack of commercial licenses limited the Lepp brothers from gaining larger, lucrative contracts. The break came in early 1950s when Henry and George were able to purchase the Watson Trucking Company, together with the “H” plates authorizing transport of goods anywhere in the Fraser Valley. With the addition of five trucks, the fleet now stood at seven. A building boom in the Abbotsford area offered seemingly unlimited constructions jobs. To take advantage of these opportunities, the company purchased Caterpillar excavating equipment. Basements needed to be dug and residential subdivisions developed, so much so that by the late 1960s most of the new house basements in Clearbrook were dug by Lepp brothers equipment. The Lepps continued with the Watson contracts, hauling sand from Abbotsford to a foundry in Vancouver and on the return route, bringing coal to Abbotsford. In summer, Lepp trucks were busy hauling fruits and vegetables, including a transporting watermelons from Yakima, Washington. With the further addition of heavy duty equipment, the Lepps contracted with the Municipality of Abbotsford, building roads in summer and snow removal in winter time. A growing fleet required new offices and a maintenance yard. In the early 1960s the new company headquarters was relocated from Abbotsford to Clearbrook, at the corner of South Fraser Way and Commercial Streets. Included on this site were office spaces, garages and a repair shop, employing two mechanics. By 1964 Lepp Brothers Trucking employed a staff of eighteen. Henry focused on hiring drivers, signing contracts, despatching loads and general management of the company. George was principally responsible for operating excavation equipment. One of the larger contracts in 1964 involved building a dyke around the large, new municipal sewer system. By 1970 the company employed ten drivers during winter months, and more than twice that number in summer. 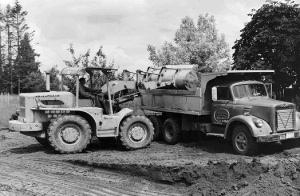 During the decade of the 1960s construction in the Fraser Valley was brisk, resulting in the addition of several low-bed trailers to haul heavy excavation equipment. Subsequently, the company was awarded several contracts building logging roads. Highway construction jobs were plentiful. Lepp company trucks were busy building, graveling and seal-coating new roads throughout British Columbia. When the original floating bridge was built in Kelowna, it was a Lepp truck that delivered the first load of gravel. As with any company, there were also difficulties. Conflict with BC labour unions could at times be sharp. Unfortunate trucking accidents needed attention. Low business cycles meant that only on-the-job trucks could be licensed. What had been a very successful, growing family venture in the Fraser Valley came to an end in 1973. The business had expanded to the point where, according to Henry, “it was too big to be small and too small to be big.” Licensing, insurance and union demands became oppressive. It was time to liquidate the company. Henry and George Lepp were involved in more than profit making. Frequently their equipment was assigned to gratis work, digging basements for churches and schools or assisting in the completion of community landscaping details. Lepp equipment built the first road into Columbia Bible Camp (now Stillwood Camp and Conference Centre) and excavated the first swimming pool. Over the years unpaid debts were forgiven. The Lepp brothers were known for the fairness with which they treated employees, and integrity in their business dealings. All along both Henry and George have been active church members, George in the Central Heights congregation and Henry at the Bakerview Mennonite Brethren Church. Interviews with Henry Lepp, Lawrence Warkentin, and Len Derksen. Abbotsford, Sumas and Mission News (various issues). Giesbrecht, David. "Lepp Trucking Company Limited (Abbotsford, British Columbia, Canada)." Global Anabaptist Mennonite Encyclopedia Online. March 2009. Web. 22 Apr 2019. http://gameo.org/index.php?title=Lepp_Trucking_Company_Limited_(Abbotsford,_British_Columbia,_Canada)&oldid=134869. Giesbrecht, David. (March 2009). Lepp Trucking Company Limited (Abbotsford, British Columbia, Canada). Global Anabaptist Mennonite Encyclopedia Online. Retrieved 22 April 2019, from http://gameo.org/index.php?title=Lepp_Trucking_Company_Limited_(Abbotsford,_British_Columbia,_Canada)&oldid=134869. This page was last modified on 6 July 2016, at 08:40.